To mark the Fourth United Nations Global Road Safety Week (May 8 – 14),UL, a global safety science leader and National Institute of Mental Health and Neuro Sciences (NIMHANS) has released an exhaustive analytical study titled “Advancing Road Safety in India: Implementation is the Key”. To serve as a ready reckoner, UL and NIMHANS also released a summary study, along with a ‘facts and figures’ report.Intended as a reference document to aid multiple stakeholders in developing comprehensive mechanisms to address the road safety crisis currently afflicting the country, the pan-Indian study delves into the accident data sourced from various government and independent, national and international reports and studies. It also offers a state wise perspective to indicate differential burden of road traffic incidents. · Based on a summary of available data from Indian studies, it can be concluded that pedestrians (30 – 40 %), two wheeler riders/ pillions (30 – 40 %) and cyclists (approximately10 %) account for nearly 80 % of road deaths and injuries, which is in contrast with official reports due to fallacies in reporting practices. · Few Indian studies indicate the number of deaths is likely to be higher by nearly 20 %, while serious injuries are underreported by more than 50 % as compared to official reports. · The five southern Indian states of Karnataka, Tamil Nadu, Kerala, Andhra Pradesh and Maharashtra together accounted for 46.8% of accidents. · As per national reports, only 22.1% of accidents and 11.3% of road deaths occurred in the 50 million plus cities in India in 2015. (MoRTH, 2015). Thus, it is clear that large number of road crashes and deaths occur on rural roads (that also include most of the national and state highways) where road safety is yet to gain prominence. · Indian Highways (54, 72,144 kilometers) account for 4.84% of road length but contribute to half (52.4%) of road accidents and 63% of road deaths in India. · Very few injured and seriously affected persons receive adequate trauma care and situation is worse in rural India. · Irrespective of data source and nature, in more specific terms, 100% of the severely injured, 50% of the moderately injured, and 10–20% of the mildly injured will have lifelong disabilities. 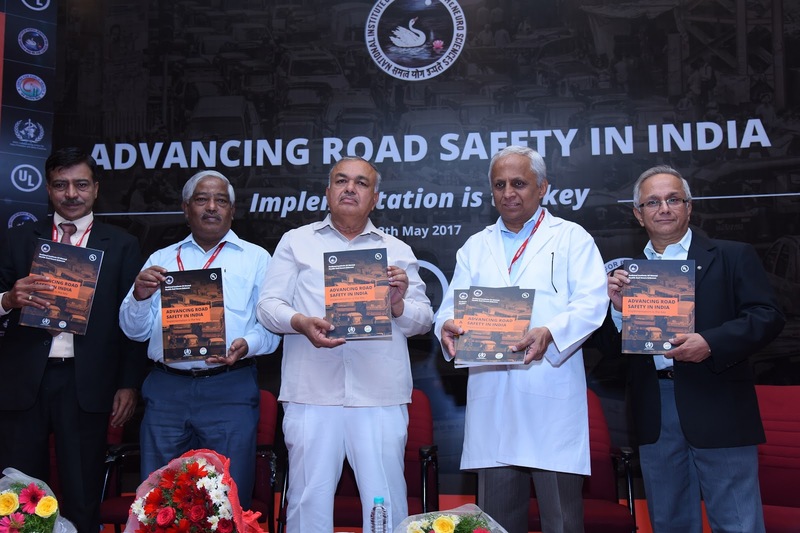 The study was released by R. Ramalinga Reddy, Minister for Transport, Government of Karnataka at the national symposium ‘Advancing Road Safety in India’ jointly organized by UL and NIMHANS, where experts also deliberated on the study’s suggestions for positive safety outcomes. The comprehensive reports were developed by the WHO Collaborating Centre for Injury Prevention and Safety Promotion and Centre for Public Health at NIMHANS, Bangalore. Commenting on the launch of the report, R.A. Venkitachalam, Vice President, Public Safety, UL, said, “It would not be an exaggeration to state that the lack of safety on Indian roads is tantamount to a public emergency. With the recent passage of the Motor Vehicles Bill in the Lok Sabha, there is a renewed vigor on part of the government to gear the country toward safer roads. However, the situation cannot be rectified by one agency alone – multiple stakeholders, from the government, corporates, auto manufacturers, law enforcement, health care professionals, educational institutions and road safety experts need to collaborate on a scientific level to evolve sustainable solution for the problem. At UL, we have always believed in the efficacy of applying science to solve any safety issue. Our association with NIMHANS is one of the most important engagements in India to further our public safety mission. Imbued with varied perspectives, this data rich report is without doubt, a crucial starting point to further advance the agenda of road safety in India”. Dr G. Gururaj, Head of WHO CC and Centre for public Health at NIMHANS and the author of national road safety reports mentioned that “Road safety in India has been a neglected area amidst rapid developmental policies and programmes and faces multiple challenges in implementation. Essentially road safety is science and requires a scientific approach to address the problem that needs to move beyond simplistic answers. Advancing road safety needs a framework based on good quality data that should bring multiple stake holders to implement solutions in a convergent manner with systematic monitoring and evaluation of programmes and interventions”.